Breastfeeding is not necessary for the good oral health of your baby, but there are several benefits to it in this area. However, breastfeeding moms should take some important precautions to help protect their babies' oral health, too! Breastfeeding may result in a better bite. A June 2015 study from Pediatrics has found that babies who were breastfed exclusively for six months were 72% less likely to develop malocclusion issues (such as crossbites, open bites, and overbites) than babies who were breastfed for less than six months or that were not breastfed at all. Now, just because you breastfeed your baby doesn't mean he or she won't one day need braces. And it certainly doesn’t mean that bottle fed babies are doomed to develop malocclusion. There's a variety of other factors that can impact your child’s future orthodontic needs. These include genetics, pacifier use, and thumb sucking, to name a few. Breastfeeding reduces the risk of baby bottle tooth decay. Baby bottle tooth decay comes about when a baby's teeth are frequently exposed for long periods of time to drinks that have sugar in them. This tends to happen when babies are regularly sent to bed with a bottle of formula, milk, or juice. Breastfeeding, especially when done exclusively, can minimize or remove this risk. Be careful: breastfed babies can still get cavities! In fact, in some cases breastfeeding may even cause cavities. Because breast milk is viewed as more ‘natural’, many people don't realize that it still contains sugar just like formula does. That means that without good oral hygiene, it can cause cavities, too. Good oral hygiene is important for your baby's oral health, whether you're breast feeding or bottle feeding. 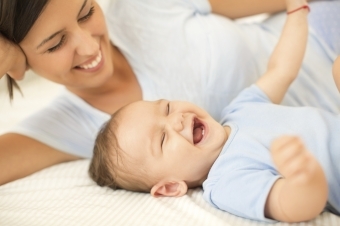 Clean your baby's gums at least daily (and ideally after each feeding) with a gauze pad or a clean, damp cloth. And once the first tooth comes in, start a twice daily brushing routine to keep tooth decay at bay. If you have questions about breastfeeding and oral health, or about how to brush your baby’s teeth, please contact SmileTown North Delta to book an appointment. We can help!